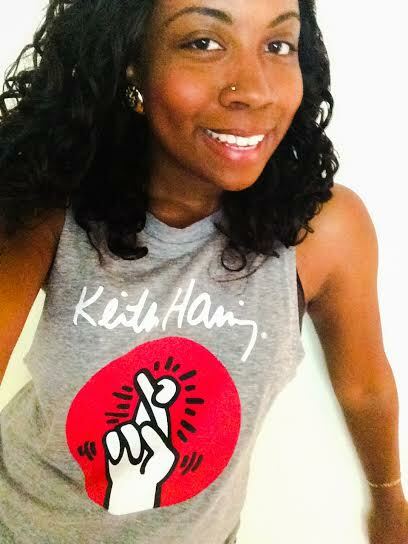 Today I’m rockin’ a Keith Haring tank top. I’m soo happy that his work is getting ‘reborn’ with my generation! In case you didn’t know, Keith Haring was a prolific artist and activist in the late 1970s and 80s. His artwork, which began as graffiti in the subway stations of NYC, is reflective of social issues of the 80’s, including HIV/AIDS, war, sexuality and poverty. I didn’t learn ANYTHING about him and his work until I was a junior in college sitting in an American Studies class. I think its a shame that public education often dismisses those off the beaten path of mainstream Anglo culture. Keith Haring, who was a gay man living with AIDS, got no exposure in the large public high school I attended; however, his timeless work, intellectual zeal, attention to detail and conscious spirit will live on, no matter what.